2 Bedroom apartment on the 3rd floor of the chalet. Modern and spacious at 86m2, one double bedroom and one twin. South facing balcony. 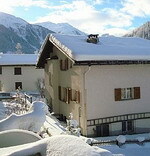 Apartment Breithorn is located on the 3rd floor of the chalet on the Western side. It is very spacious at 86m2 and comprises one double bedroom and one twin bedroom. It is furnished in a contemporary style and has an open plan living dining area and a fully equipped good size kitchen. There is an LCD TV with satellite and a DVD player. The balcony is large with plenty of room to sit and enjoy the incredible South facing views of the Eiger and valley below. Sleeps 4. Luxury 3 bedroom, 2 bathroom 156m2 apartment. Quality and modern furnishing with a 150m2 South facing terrace. This apartment is very large at 156m2 with a large master suite, a second double bedroom and a twin room. There is beautiful kitchen, with brand new top of the range applicances and granite worktops. An open plan dining/ living room with an open fireplace and a massive 150m2 South facing terrace offereing incredible views of the Eiger and the valley below. There is a separate ski and laundry room and 2 undercover parking spaces. Sleeps 6. 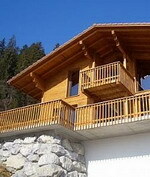 Beautiful New chalet with stunning views, balcony on 2 sides, sleeps 8 in 4 en-suite bedrooms. Large, open plan lounge/dining area. Sauna. Zweisimmen is a lovely little village, small enough to get to know it quickly, but big enough for a change of shops and restaurants. Our chalet is a Luxury self catered chalet with four double/twin bedrooms all with ensuite bathrooms. Large open plan luxury kitchen with open plan living area featuring a cosy area with tv and sink in sofas. and a day lounge with magnificent views and balconies. Double garage. Sauna and shower area downstairs. 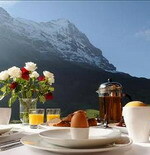 20 minutes walk or 3 minute drive to the centre of Zwesimmen village with bars, night life, restaurants and ski lifts. Zweisimmen village in the Bernese Oberland forms the gateway to the world-famous Gstaad-Saanenland region. Zweisimmen is also the starting point of the Montreux – Bernese Oberland – rail line, which travels to Montreux on Lake Geneva. Sleeps 8. 2 Bedroom apartment on the 3rd floor of the chalet. Modern and spacious at 86m2, one double bedroom and one twin. South facing balcony. Apartment Matterhorn is located on the 3rd floor of the chalet on the Eastern side. It is very spacious at 86m2 and comprises one double bedroom and one twin bedroom. It is furnished in a contemporary style and has an open plan living dining area and a fully equipped good size kitchen. There is an LCD TV with satellite and a DVD player. The balcony is large with plenty of room to sit and enjoy the incredible South facing views of the Eiger and valley below. Sleeps 4. 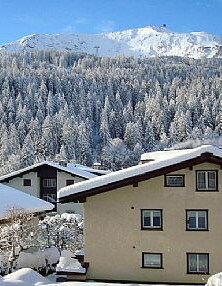 Our 3 bedroom, 2 bathroom attic apartment at 120m2 is very spacious and modern with stunning floor to ceiling South facing views of the Eiger. This 120m2 3 bedroom apartment is stunning, it is set on the top floor of the chalet in the attic, providing double height wooden ceilings. It is furnished in a modern style, and comprises 2 double bedrooms and a twin room with 2 bathrooms. The open plan dining and living area is very spacious with spectacular South facing views from the floor to ceiling windows towards the Eiger. You are provided with an LCD TV with satellite and a DVD player. Sleeps 6. The property is on the third floor and spread over 2 floors the lower floor consists of the lounge which is equipped with a 2 an3 leather recliing sofas and a chair with footstool kitchen 2 double bedrooms and 2 shower rooms and a balcony there is an open fire and logs are supplied The upper floor is reached by a spiral staircase to 2 further double ensuite bedrooms each with a balcony. It is near the centre of Haute Nendaz 400 metres form the ski lift and the retaurants and shops are nearby. Haute Nendaz Is within the four valleys comprising Verbier, Siviez, Veysonnaz and Hautes Nendaz and is reted as being the best for intermediate skiers and extend terrain for experts and snowboarding. Tracouet above Haute Nendaz has an excellent ski school for beginners. A Ski Bus runs every 20 mins round the village during the winter season. The highest lift is 3300m and many pistes are above 2500m skiing and snowboarding is available throughout the season (December to late April). Sleeps 8.